Product prices and availability are accurate as of 2019-04-23 10:49:32 UTC and are subject to change. Any price and availability information displayed on http://www.amazon.com/ at the time of purchase will apply to the purchase of this product. Size S-----Length 66cm/26.0"-----Bust 96cm/37.8"-----Sleeve 16cm/6.3"
Size M------Length 68cm/26.4"-----Bust 100cm/39.4"-----Sleeve 17cm/6.7"
Size L-------Length 71cm/27.9"-----Bust 104cm/40.9"-----Sleeve 18cm/7.1"
Size XL-------Length 73cm/28.7"-----Bust 110cm/43.3"-----Sleeve 19cm/7.5"
1). You can check our store "DUTUT "for a full range of clothes of similar styles. 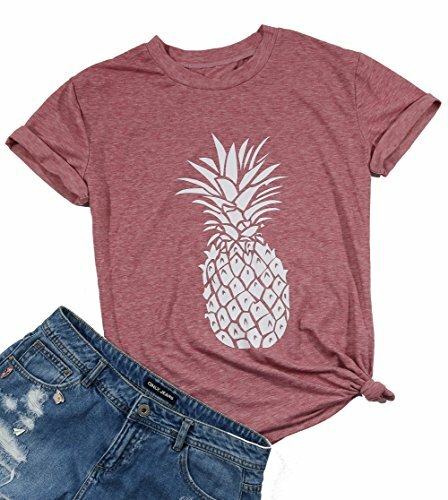 Material: Cotton Blend.Soft, Stretchy, Breathable Style:Pineapple Printed, Round Neck ,Short Sleeve,Casual Style Occasion: Great for the gym, workouts, social events, chores,Beach,School ,etc ? How to Care: Recommended with COLD WATER / Do Not Bleach / Hang Or Line Dry. (Do not wash it by warm water or use dryer, this may cause the print fall down!) ? NOTE NOTE NOTE:plz refer to our Size Chart at left picture or in description(Not the Amazon size chart).